Vedantu.com - No.1 online tutoring company in India provides you Free PDF download of NCERT Solutions for Class 12 Biology Chapter 6 - Molecular Basis of Inheritance solved by Expert Teachers as per NCERT (CBSE) Book guidelines. All Chapter 6 - Molecular Basis of Inheritance Exercise Questions with Solutions to help you to revise complete Syllabus and Score More marks. Register for online coaching for AIPMT(NEET), Engineering and Medical entrance exams. NCERT Grade 6 Biology Chapter 6, Molecular Basis of Inheritance is from the Unit, Genetics and Evolution. This chapter begins with understanding the structure of the most interesting molecule in the living system, that is, the DNA. In subsequent sections, students will understand that why it is the most abundant genetic material, and what its relationship is with RNA through this chapter.The DNA, The Search for Genetic Material, RNA World, Replication, Transcription, Genetic Code, Translation, Regulation of Gene Expression, Human Genome Project and DNA Fingerprinting are the main topics discussed in this chapter.Similarly, Structure of Polynucleotide Chain, Packaging of DNA Helix, The Genetic Material is DNA, Properties of Genetic Material (DNA versus RNA), The Experimental Proof, The Machinery and the Enzymes, Transcription Unit, Transcription Unit and the Gene, Types of RNA and the process of Transcription, Mutations and Genetic Code, tRNA– the Adapter Molecule, The Lac operon, Salient Features of Human Genome and Applications and Future Challenges are the detailed sub-topics in this chapter. Diagrams, illustrations, flow charts, figures and lucid language make this chapter comprehensive and easy to learn. Sequential progress of topics helps to grasp and retain better.Technical terms associated to Molecular Basis of Inheritance and summarizing points are some aspects of NCERT Grade 6 Biology Chapter 6, Molecular Basis of Inheritance that make it interesting and fun to learn. NCERT Grade 6 Biology Chapter 6, Molecular Basis of Inheritance is from Unit, Genetics and Evolution. A combination of 3 chapters, this unit holds a total weightage of 18 marks in Grade 12 final examination. Get 100 percent accurate NCERT Solutions for Class 12 Biology Chapter 6 (Molecular Basis of Inheritance) solved by expert Biology teachers. We provide solutions for questions given in Class 12 Biology text-book as per CBSE Board guidelines from the latest NCERT book for Class 12 Biology. The topics and sub-topics in Chapter 6 Molecular Basis of Inheritance are given below. Ex 6.10 - DNA Fingerprinting. Chapter 6 Exercises - 14 Questions with Solutions. Other than given exercises, you should also practice all the solved examples given in the book to clear your concepts on Molecular Basis of Inheritance. 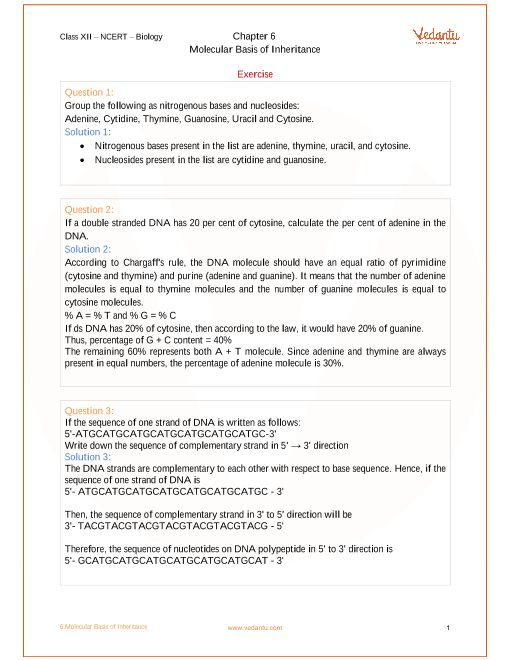 Download the free PDF of Chapter 6 Molecular Basis of Inheritance and take the print out to keep it handy for your exam preparation.